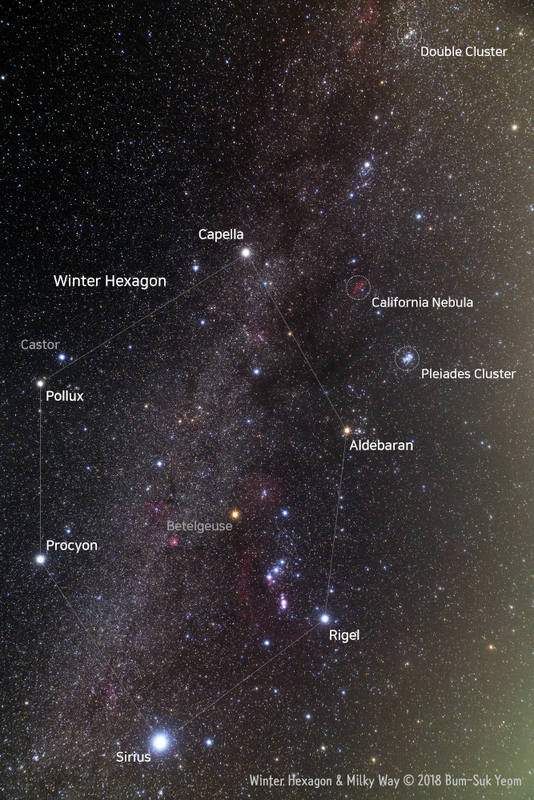 The Winter Hexagon, also known as the Winter Circle, is a prominent winter asterism formed by seven stars prominent in the winter sky. 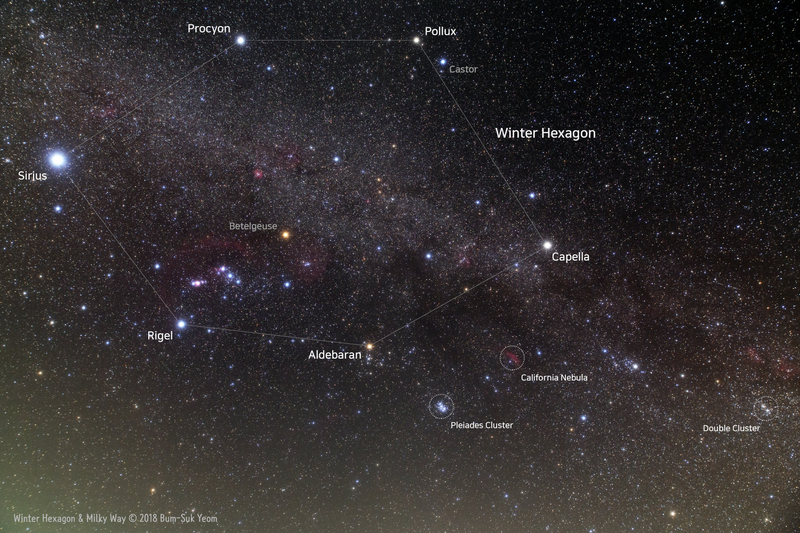 The six stars that compose the Winter Hexagon are Sirius (Canis Major), Rigel (Orion), Aldebaran (Taurus), Capella (Auriga), Pollux (Gemini), and Procyon (Canis Minor). 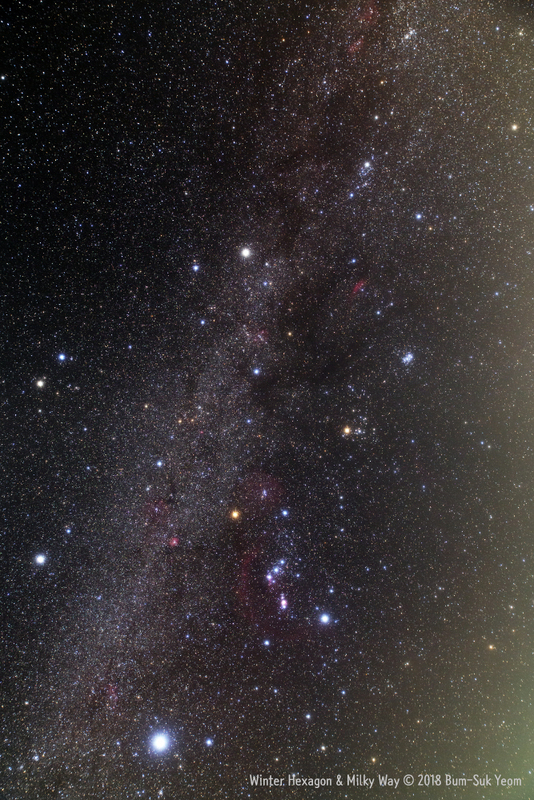 Sirius and Procyon are also part of the Winter Triangle, a smaller asterism that these two stars form with Betelgeuse in Orion. 겨울철 육각형을 이루는 6개의 별은 시리우스(큰개자리), 리겔(오리온자리), 알데바란(황소자리), 카펠라(마차부자리), 폴룩스(쌍둥이자리), 프로키온(작은개자리)입니다. 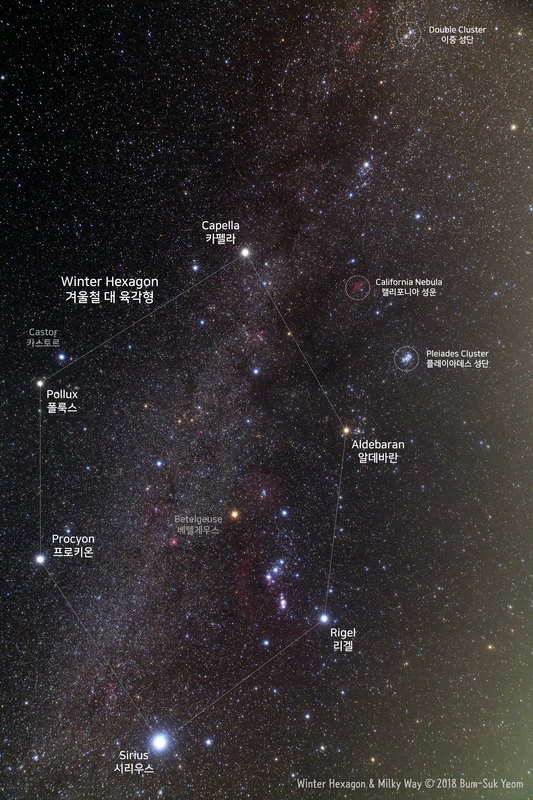 또한 시리우스, 프로키온, 그리고 베텔게우스는 겨울철의 대삼각형을 이루는 별들입니다. cf. 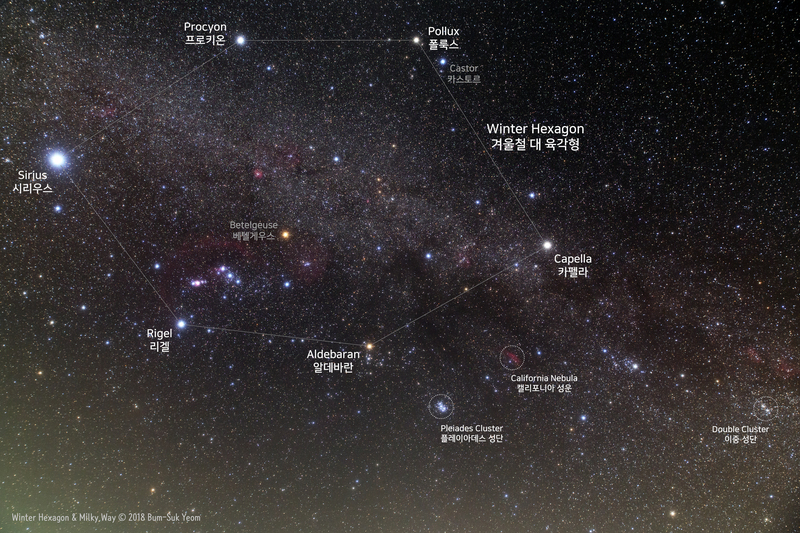 촬영 당일에 구름이 왔다갔다하는 상황이라 별자리와 겨울철 은하수가 선명하게 나오지는 않았네요. 14mm로 촬영한 이 사진은 주변부를 약간 잘라냈습니다. Taken by Bum-Suk Yeom (www.cometsky.com) on November 4, 2018 UTC @ Jangsu, South Korea. 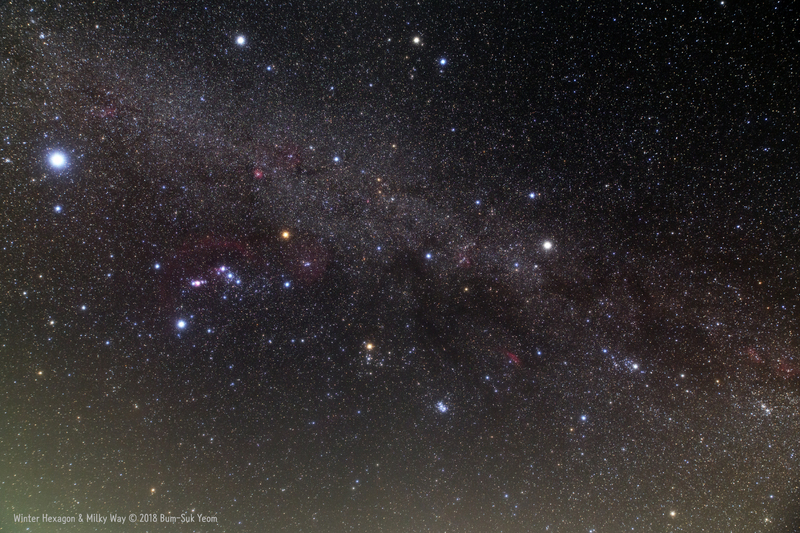 Details: 19:43 UTC (04:43 November 5 KST) Sigma Art 14-24mm F2.8 zoom lens (at 14mm) with EOS 5D Mark III camera, SkyGuider mount, Geratin filter (Lee soft #1 filter), ISO 800, f/5.6, 4 x 420 sec (total 28 min) stack.